When a dog joins your family, you may quickly become attached to this furry friend. Training and raising your dog will become your responsibilities as a dog owner. One important consideration will be keeping your dog safe while it’s outdoors in your yard. If you prefer not to tie up your dog or install a standard fence around your property, a wireless dog fence can be a suitable option. These underground fences remain out of sight, but they work effectively to keep your dog in a confined area. You may not see this pet fence, but it works invisibly to contain your dog. Instead of installing a conventional wood or chain-link fence, you can purchase an electric dog fence. Connecticut dog owners know that inclement weather can make walking a dog unpleasant, especially during the winter. Instead of braving cold and blustery weather, you can simply let your dog out into your yard without worrying about safety issues. 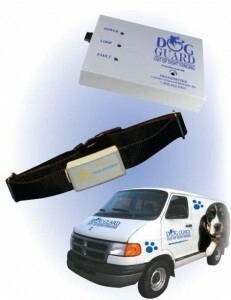 Your dog must wear a special receiver collar that works in conjunction with the sensors. This collar is comfortable, and most dogs tolerate it without issue. The collar emits a radio signal. When your dog approaches the sensors at the perimeter, a stimulus will occur. If your dog continues to approach the perimeter, a second, stronger stimulus will occur. The reminder zone around the perimeter is three to six feet in width. You can also choose between your dog receiving an audio signal alert or a mild stimulus alert. After you buy the fence, you will need to install it, though if you’re buying from Dog Guard, we’ll gladly set everything up for you so you don’t have to worry about it. But if you do want to try taking on this task yourself, first, you must define the area in which you want to confine your dog. You might wish to give your dog the freedom to explore your entire backyard, in which case you would install the underground sensors at your property line. Alternatively, you can also install the wireless sensors in a specific perimeter to designate a smaller area of your yard for your dog. After defining the area, you are ready to install your hidden fence. CT dog owners may wish to perform installation work during the spring, summer, or fall to avoid digging in frozen ground. Follow product instructions to bury the sensors underground. You will also position boundary flags to indicate the placement of the sensors. The next step involves training your dog to stay inside the designated area. (Again, if you’re one of our customers, we’ll help get you started on this.) Your dog probably won’t understand the hidden fence. CT dog owners will need to spend some time out in the yard with their dogs to teach them the perimeter. Generally, walking a dog on a leash just inside the perimeter is an effective teaching method. As you walk your dog inside the sensors, give verbal commands so your dog learns to avoid the boundary flags. Eventually, your dog will learn to stay away from the perimeter area. Once your dog understands the perimeter, you can remove the boundary flags. The training period for using this fence typically takes about two weeks. By understanding training methods, you can ensure a successful installation of the wireless dog fence. Connecticut dog owners might worry that using this fence is cruel due to the harmless vibration that dogs receive when nearing the perimeter. On the contrary, this vibration has been tested and found to be harmless to dogs. The vibration is unpleasant enough to make a dog avoid it, but it is no stronger than the static shock you might receive from touching a doorknob. You can use this system with more than one dog also. In fact, this boundary system can work effectively with any number of pets and with a yard as large as 50 acres. In the event of a power failure, you can have a backup battery power source installed for your electric fence. CT dog owners can then enjoy the peace of mind of knowing that the system will continue to operate until power is restored. We provide full product support and training to help you learn and use this system. You can receive guidance for customizing your containment area so it fits your specific yard and needs. Every system also comes with a 30-day money-back guarantee to ensure that you are happy with your purchase as well as a lifetime warranty on the equipment.